Poe Dameron is a flashy, spectacular pilot with a smile that can melt any glacier on Hoth. 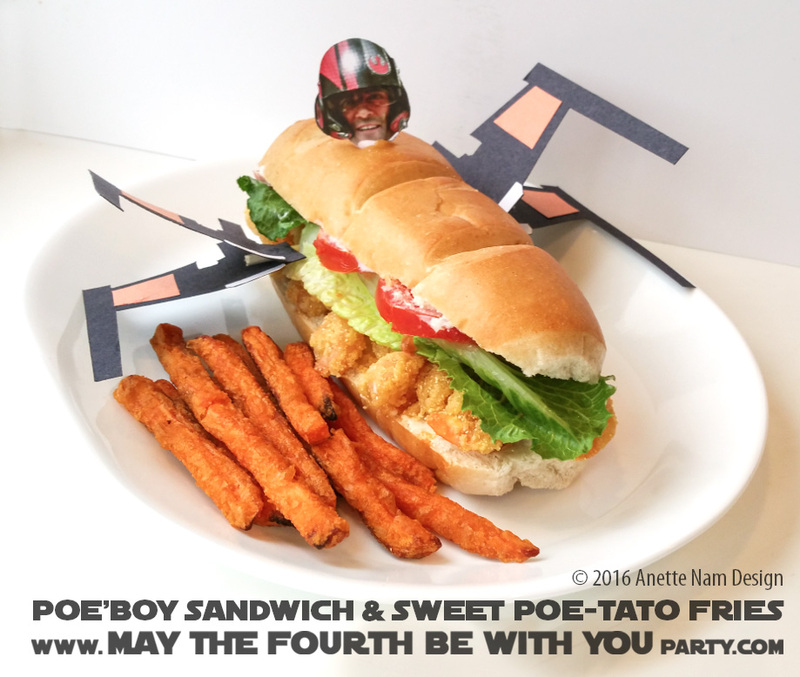 So when we where trying to figure out a Poe-themed food for our Star Wars Party in a couple of weeks, we needed something that was worthy of his pizzazz. A Po’boy might sound too humble, but I assure you it is anything but! I have to admit I have never been to Louisiana! So it is with regret that I say I have never had an authentic Po’ boy. I hear they are amazing! But short of going on a really long field trip, Emeril Lagasse’s recipe will still wow! However, for a big party with lots of food, you might want consider buying frozen breaded shrimp that you can put in the oven, instead of deep-frying your own. 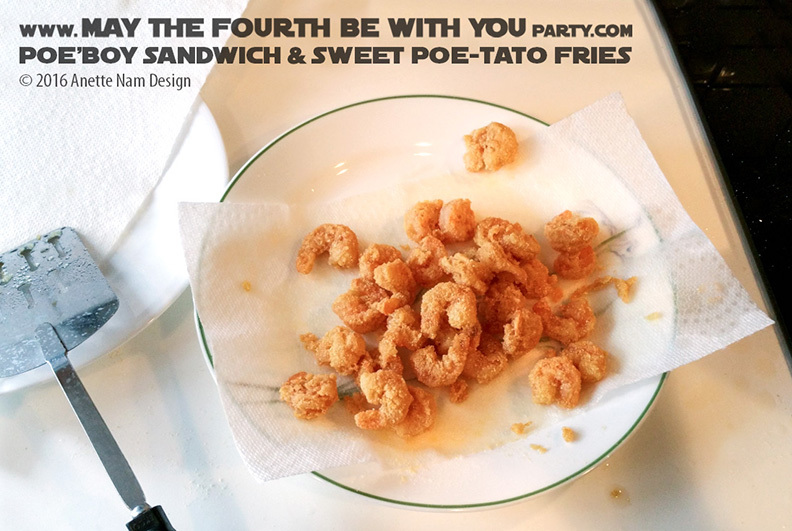 Deep-frying shrimp isn’t difficult, just a bit messy when you are dressed in Stormtrooper costume, and distracted by the padawans who are whacking each other with lightsabers, and worried about your guests who are OBVIOUSLY not letting the Wookiee win. This recipe is a modified version of Emeril Lagasse’s “Classic Fried Shrimp Po’boys” from Foodnetwork.com. The recipe is for 2 Sandwiches. Print out Poe and X-wing. Cut out and add Orange and White decorations. Glue the inside of the 2 left wings together, with a Kebob stick in the middle. Repeat on the Right wing. Fold top wings up, and bottom wings down. Cut out a Poe head. Glue a bamboo skewer stick to the back. Check the timing, but you will probably need to put your Sweet Potato Fries in the oven before starting to make your Poe’boy Sandwiches. Heat the oil in a large sauce pan or pre-heat a deep fryer to 360 degrees F.
Season the shrimp with 1 tsp “Essence”, 1/2 tsp salt and 1/4 tsp cayenne. In a medium mixing bowl combine the flour and cornmeal and season with the remaining 2 tbsp “Essence”, 1 tsp salt and 1/2 tsp cayenne. Coat the shrimp completely with the seasoned flour mixture. Fry the shrimp in the hot oil (in batches if needed) until golden brown, stirring constantly (about 4 min). Remove shrimp from the oil. Drain on a paper-lined plate. Season with salt and Tabasco sauce. Cut the loaves in half. Brush both cut sides of the bread with melted butter. Using a spatula, spread the mayo on both sides of the bread. Sprinkle with Tabasco sauce. Divide the shrimp evenly between the 2 sandwiches and garnish with the lettuce, tomato slices, sliced pickles and more Tabasco sauce, if desired. Serve with Sweet Poe-tato Fries (OBVIOUSLY! ), and a mix of Ketchup and MORE Tabasco Sauce on the side (for the fries). Make sure you don’t put too many shrimp in the pot at once. They will fry best if there is only 1 layer of shrimp in the oil at a time. FYI, I couldn’t find one where he was smiling and wearing a helmet online, so I took a picture of my TV on freeze-frame, and used that. The head should be about 1.75″ tall when done. Makes 2/3 cup. Combine all ingredients below thoroughly. This is the first time I’ve ever even heard of a Po Boy sandwich. It does look delicious though! Lol! I do love spicy food.